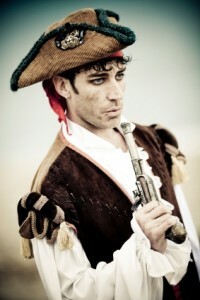 Pirate Costumes: Sail the Seven Seas! Here at Pearson’s, we know that a lot of our customers and fans love to put on the appropriate Renaissance costume when they go to a Renaissance faire or Medieval event. We love how enthusiastic that patrons can be when they sport their costumes and don their personas at these types of festivals. However, we also know that sometimes people prefer to take on the characteristics of certain types of characters that may be present at a faire. If you aren’t quite feeling like being a very proper noble or a hard at work craftsman, what are you to do? What if you decided to go a little rogue and play a swashbuckler? That’s right, why not put on a pirate costume? These cunning scalawags were around back in the days of Kings and Queens. They may not have been the kind we’re used to seeing in movies today, but they certainly existed and they are certainly fun to play at a Renaissance faire. If you are interested, make sure to visit our Pirate costumes page to see what kind of fun ensemble you can put together as you take to the pirate code.